Your MEGAPACK will be available to you as a set of 10 downloadable PDF files as soon as you complete your payment via PayPal. You will then receive an email including the download links as well as your purchase receipt. Please, check your spam folder, too. 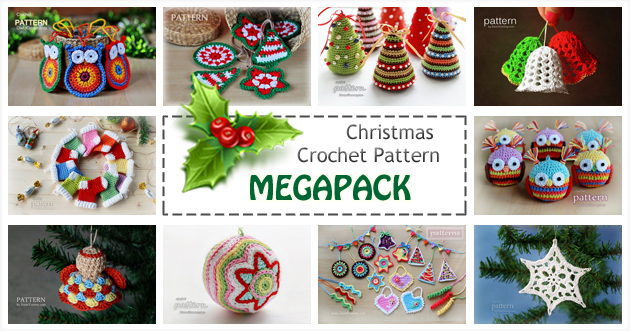 Buy the Christmas Crochet Pattern MEGAPACK for a discounted BUNDLE PRICE and save over 30% of the original price! All patterns are written in standard American terms. They contain comprehensive information on supplies, abbreviation keys and extra notes, as well as many pictures to make the projects as easy to follow as possible. YOU CAN SELL THE PRODUCTS MADE FROM THE PATTERNS! To crochet has been a part of my life,mý grandmothe TAÙGHÞ MÈwheñ I was onlythree yrs old,I’m seventy years old now and I still crochet!